The Crissal Thrasher often builds a nest in the same types of locations as does the Bendire's Thrasher. However, the range of the Crissal is much larger so it is possible to find Crissal nests in habitat where Bendire's Thrasher is not found. The nest site in the photo is only 1.5 meters above the ground in a scrub bush with very long thorns. 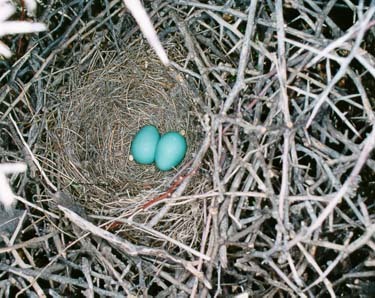 Note that Crissal Thrasher eggs are blue and unmarked. Refer to other pages on this site for examples of Curve-bill Thrasher and Bendire's Thrasher. This nest was located in South Central Arizona. Both Bendire's Thrasher and Crissal Thrasher are secretive birds. Except for springtime advertising from the tops of Palo Verde or Mesquite trees, these birds are only occasionally in full view. The Crissal has a "chewy, chewy" call that can be used to identify the bird throughout the year. The Curvebill "whit, whit" is heard often and can also be used to identify the bird. (On the Crissal recording you will hear mimicry, including a Crissal imitation of a Curvebill "whit, whit"). But the Bendire's Thrasher is another matter. It rarely calls. Tim has only heard the call a few times and it sounds sort of like "kraack". We are working to get a good recording of this. The original Crissal Thrasher sound recording was produced using a Sennheiser MKH70 shotgun microphone and the audio was stored on a 48 ksps DAT using a Tascam DA-P1 digital audio recorder. The recording was down-sampled to 44.1 ksps and converted to MPEG3 to reduce the file size.